We're all a little excited around here! Kimono: Minty, clean ALL the things. Minty: Clean ALL THE THINGS!!! 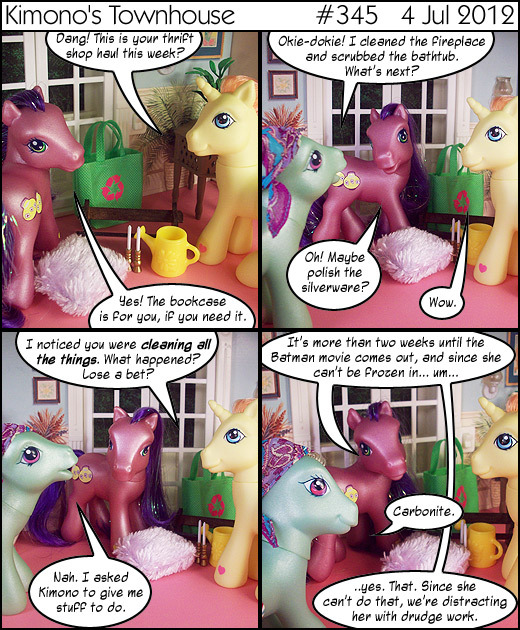 Minty: Clean ALL the things? Also I love Minty's little kerchief, that is so cute. Keep the gunk out of her mane! Also, a question... have you ever thought about posting the comic at tumblr? I'm also looking forward to the movie, mostly because my pretty fireman has a (very minor, I assume) role in it. I thought she'd be cleaning in exchange for costume help from Kimono, too. Also, will Minty go to the new Spiderman movie? xD Handy. I have to remember this next time I'm eagerly awaiting something.